Isabelle Arsenault is an illustrator who studied Graphic Design at the Université du Québec à Montréal (2001). After her studies, she quickly contributed to several magazines in Canada and the United-States. In 2004, Isabelle illustrated her first children's book, for which she received the prestigious Governor General's Award for children's literature in French (illustration). Her passion for illustrated books has led her more and more to continue pursuing this path. Since then, she was a finalist on two other occasions for the GG's ("My Letter to the World", "Migrant"), finalist for the Marilyn Baillie Award in 2011 ("Spork") and her book "Migrant" is among the 10 best illustrated books of 2011 according to The New York Times. 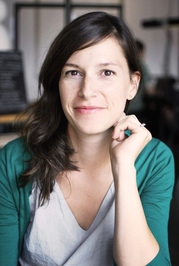 In 2012, sh Isabelle Arsenault is an illustrator who studied Graphic Design at the Université du Québec à Montréal (2001). After her studies, she quickly contributed to several magazines in Canada and the United-States. In 2004, Isabelle illustrated her first children's book, for which she received the prestigious Governor General's Award for children's literature in French (illustration). Her passion for illustrated books has led her more and more to continue pursuing this path. Since then, she was a finalist on two other occasions for the GG's ("My Letter to the World", "Migrant"), finalist for the Marilyn Baillie Award in 2011 ("Spork") and her book "Migrant" is among the 10 best illustrated books of 2011 according to The New York Times. In 2012, she received her second Governor General's Award for the illustrations of "Virginia Wolf" in addition to winning Le Prix jeunesse des libraires du Québec for "Fourchon" (French version of "Spork"). Isabelle Arsenault isn't a Goodreads Author (yet), but she does have a blog, so here are some recent posts imported from her feed.